SysTools migration tool to transfer Office 365 Admin mailbox, users mailbox, shared mailbox(es) from one Office 365 to another Office 365 account/ domain. Office 365 tenant to Office 365 tenant migration tool will migrate entire mailboxes data from one Office 365 tenant to another tenant. Office 365 Express Migrator has turned out to be most trust gaining tool to migrate mailboxes from one Office 365 tenant to another on CNET. 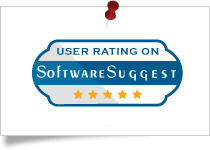 On softwaresuggest, this Application has been recommended as an optimal solution for users to migrate from Office 365 to another Office 365. Every time I searched for migration of Office 365 data to another Office 365 mailbox, I was provided with the option to upgrade my license. 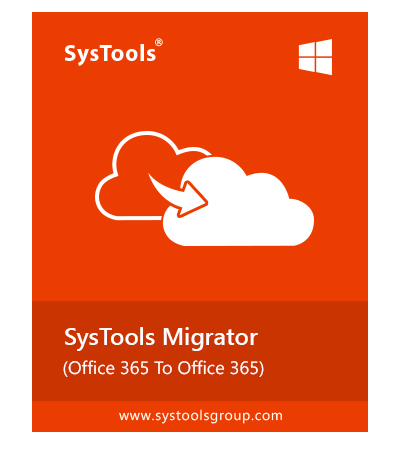 I am so grateful to SysTools Group for providing the Office 365 to Office 365 migration tool that takes care of the process that falls after license upgrade, which no one else does. Though the interface was quite friendly and didn't involve any complicating steps, at some point when I got stuck, contacting support team proved helpful. Hats off to the executive who patiently helped me out at each step of moving domain to Office 365 without any delays. Thanks to the SysTools Group team to provide astonishing solution to export Office 365 user mailbox to another Office 365 mailbox. 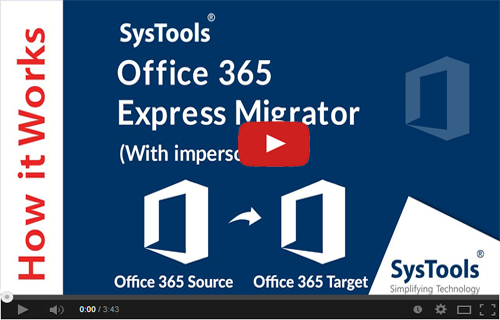 Why Office 365 Express Migrator? To perform quick and easy Office 365 tenant to tenant migration without any data loss, one can opt for Office 365 Express Migrator. The software allows the user to perform multiple SaaS Office 365 tenant mailbox to another tenant migration. One can easily synchronize contacts and information to make sure that co-workers can send/receive emails and collaborate easily. Additionally, the utility offers the fastest possible Office 365 to Office 365 migration without affecting the communication process. Security and Performance: The software does not store any credentials such as user-name and password in the software's interface or database while the migration process. Complete privacy of Office 365 user's is maintained by utility while the migration process. When it comes to performance factor, the software exhibits high-performance nature and also holds the integrity of Office 365 data. SysTools provides efficient solution to perform Office 365 tenant to tenant migration and also provides other numerous tools to perform SharePoint migration and OneDrive migration. Mailbox Migration Scope: While migrating mailbox from one Office 365 tenant to another, the tool allows the user to export Office 365 data including Emails, Contact, Calendars, Tasks, Shared Mailbox in a trouble-free way. Migration With Impersonation/ Without Impersonation: The Office 365 to Office 365 migration tool offers with and without impersonation options while perform migration. 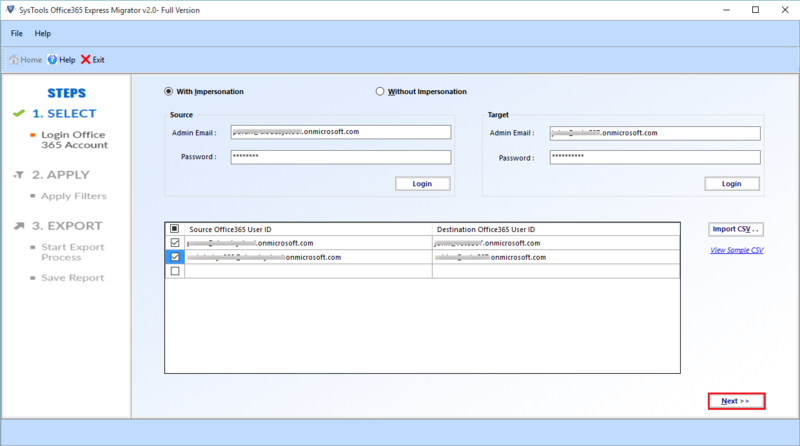 With Impersonation option, the user can perform the migration of complete Office 365 data to another O365 account/ tenant by providing source and destination admin credentials. On the other hand, Without Impersonation option, offers selective mailboxes migration process. For this, the software allows the user to import a CSV file containing user ID and password associated with the individual user mailbox. Office 365 Domain Mailbox Migration Between Different Tenants: Office 365 Express Migrator, makes Office 365 domain to domain migration an easy task. As the software provides a mail routing platform that routes mail automatically from the source domain to target domains. Office 365 Migration Between Two Domains in the Same Tenant: The Office 365 to Office 365 mailbox migration software also offers a facility to migrate Office 365 emails, contacts, calendars, tasks, shared mailbox between two different domains in the same tenant. The Office 365 tenant to tenant migration software allows you to transfer Office 365 mailbox to another account. It converts emails, contacts, calendars and task items from one MS Office 365 account to another Office 365. The software will map and export data from one mailbox into any desirable mailbox of your choice on the other Office 365 account. 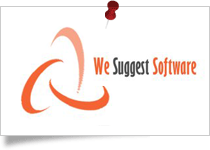 The software will retain all Meta properties while exporting data from source to destination. In order to start the transfer, users need to provide the mailbox credential for both source and destination. For this, instead of adding them manually one by one, you can add a CSV file having the details of Source Office 365 ID, Source Office365 Password, Destination Office365 ID and destination Office 365 password. A sample CSV file is embedded within the tool for reference purpose. The application allows the user to move mailboxes from Office 365 domain to another tenant via using Without Impersonation option. To implement the migration process, the user has to import a CSV file containing user ID with respective passwords and destination tenant. The tool allows the user to move data from one user mailbox to another in the same domain. Moreover, the software also maintains the integrity of data and security of the Office 365 data and user’s credentials. With Office 365 tenant to tenant migration tool, one can easily perform Office 365 mailboxes to Office 365 Migration of Different Domains. Migration Between Two Domains in Different Tenants: The utility permits the user to migrate Office 365 data including emails, contacts, calendar, tasks, shared mailbox from one domain to another in two different tenants. Migration Between Two Domains in Same Tenants: The software is capable to migrate Office 365 data between two different domains in same tenants in a hassle-free way. With Office 365 Express Migrator, one can easily transfer Office 365 data from one tenant to another in bulk. The software provides Impersonation and without Impersonation options which makes easy for the user to perform full or selective Office 365 mailboxes migration process. With Impersonation: This option allows the user to migrate complete Office 365 user’s mailboxes including emails, contacts, calendars, tasks shared mailboxes in just a few clicks. 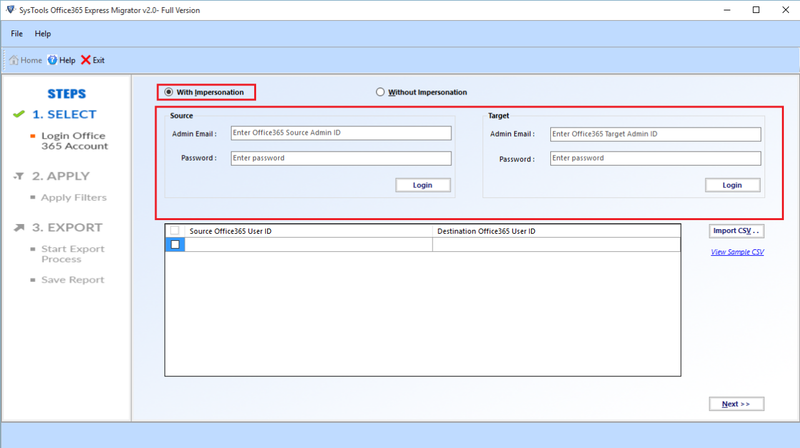 Without Impersonation: This option offers the user to perform the selective O365 mailbox migration. The user just has to import a CSV file with user ID’s, passwords and a destination tenant. A Shared mailbox is one most important component of Office 365. Basically, it allows the users to view and send email from a common mailbox. Sometimes, the need arises to migrate Shared mailboxes. Thus, one can make use the software to migrate Shared mailboxes from Office 365 to Office 365. 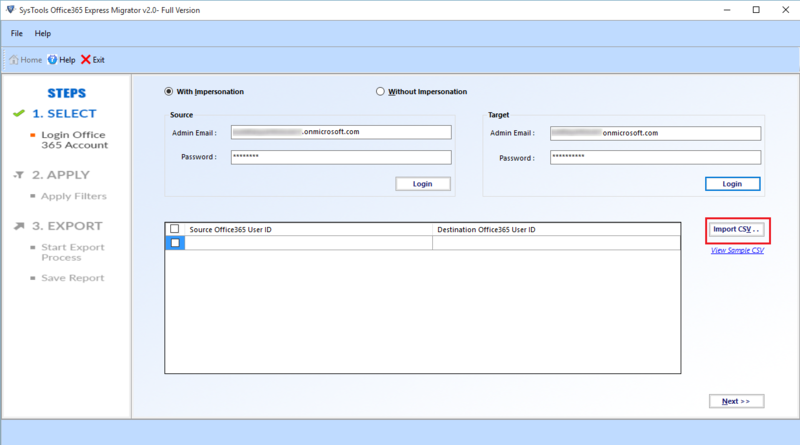 For this, the user has to log in with Admin credentials using Impersonation option. The Office 365 tenant transfer Software moves data from one Office 365 to another Office 365 account & also allows you to filter the emails received within a specific date range. It is possible to export the emails, tasks & calendars between "From" to "To" date range by setting the filter accordingly. Also it will be easy to migrate Office 365 tenant to another tenant migration with selective date range. 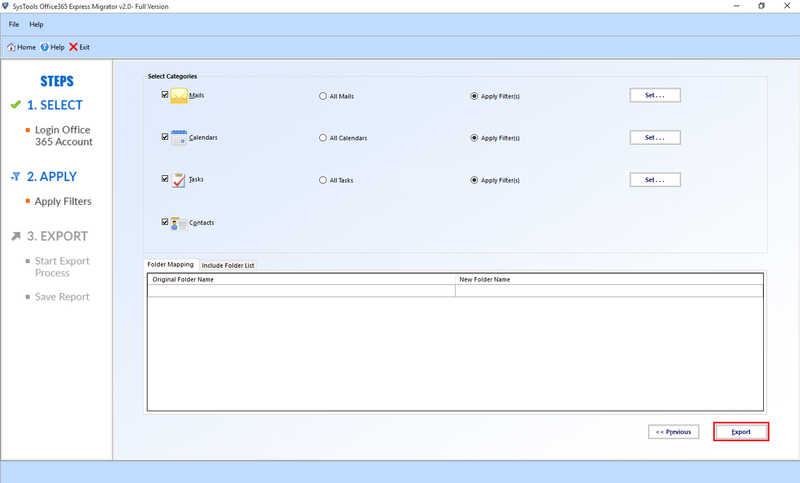 Exchange Online to Exchange Online Migration utility provides you the option to export mails, contacts, calendars and tasks. But if you need to convert only selected items, then you can check or uncheck items from the software interface. The software will only transfer/ move selected items by maintaining the complete folder structure. As you add the source and destination mailboxes, Office 365 to Office 365 migration tool first maps the mailboxes. After mapping, it will authenticate each mailbox and proceed with the migrations. You can see the mailbox authentication process in the current status window after you click on the Export button. As the Office 365 transfer begins; software will show you the complete details and count of mailboxes being converted from source to destination. You can view both current status report as well as final report which include details like: name of mailbox, mails count, contacts count, calendar count, tasks count and the time consumed for the complete migration. The Office 365 tenant migration tool provides an option to pause the process and resume whenever needed. The migration will resume from the point where it was pause. This way the tool ensures to import/ transfer email domain to Office 365 without interruption. This Office 365 tenant to tenant migration application allows the users to move folders by just entering the list of folders (as inbox, sent, etc). This allows the users to perform the selective migration only for those folders which they need to transfer. Demo version of Office 365 to Office 365 Migration Tool can transfer/move 100 mails and 25 other item categories like Calendars, Contacts and Task of one Office 365 to other Office 365 account. If you are using Window 8.1/8/7/10 or Vista, then please launch the tool as "Run as Administrator". What makes Office 365 to Office 365 email migration tool unique from others? "Mention some important qualities of this utility which makes it distinguishable among the other similar tools for moving domain to Office 365." 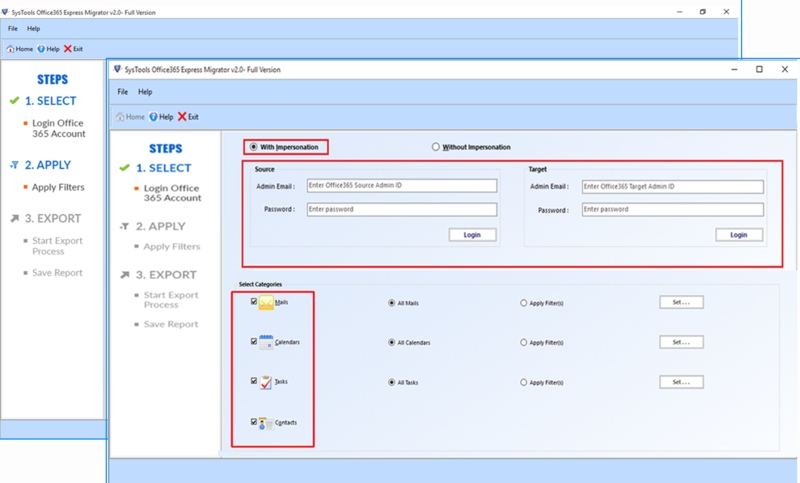 Step 7 –:Migrate Office 365 shared Mailbox to user mailbox easily, you have to enter shared mailbox ID and destination user mailbox ID to perform the migration. We are planning to move to another O365 domain. So can we migrate from one Office 365 tenant to another using this utility? Yes, our Office 365 tenant to Office 365 tenant migration tool is efficient enough to move domain from one Office 365 account to another. Can I use the tool on my Windows 10 machine for moving domain to Office 365? Yes, It is possible to use the Office 365 tenant to tenant migration tool on any machine having Windows OS version 10 or below installed in it to migrate mailbox from Office 365 to Office 365 account. Is it possible to move/transfer multiple Exchange Online account within a single domain? Yes, Our migration software can easily move/transfer Exchange Online to Exchange Online of multiple mailboxes within as well as across the Office 365 tenants. What if the migration process gets interrupted? Do I have to start the process all over again? No, You don't need to start the process from the beginning. SysTools Office 365 to Office 365 migration software provides uninterrupted migration as it provides pause and resume option to its users. With this feature, the users can resume the process of Office 365 transfer domain to another account from where it was paused. Does this tool migrate shared mailboxes from Office 365 to Office 365? Yes, You can use this tool to migrate any shared mailboxes of Office 365 into any user mailbox or into any shared mailbox.It even lets Office 365 migrate shared calendar to another account. 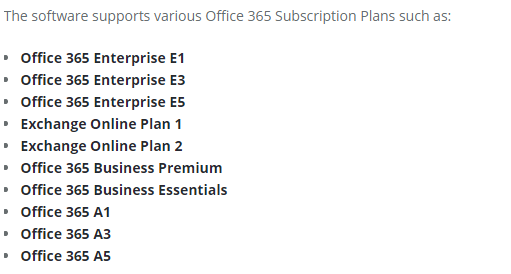 Which are the Exchange Online Subscription plans on which the Office 365 Express Migrator is compatible to work on? I have been searching for the best solution to migrate Exchange Online to another tenant. Then one day, my friend suggested me your Office 365 tenant Transfer tool. The tool made me realise that, with the right product, even the Office 365 tenant to tenant migration same domain is an easy task. After using this tool, I have become a fan of SysTools' products. Kudos to the development team of SysTools! At first I was hesitant to use third-party Office 365 to Office 365 migration tool. But on arriving at your product page, I tried out the demo version. On using the free version, I bought the tool as it was all I wanted. Thanks for this product! I am looking forward to many more efficient and reliable products! I was worried about how to migrate contacts to Office 365. I found this tool while browsing through Google and it was a real help for me to migrate Office 365 tenant to another tenant. Even though I am a non technical person, it was really easy for the Office 365 transfer domain to another account with this tool. Thanks to SysTools team for providing this utility to transfer email domain to Office 365.